Housing Minister, Binyamin Regional Council head connect Memorial Day with right to settle the entire Land of Israel. 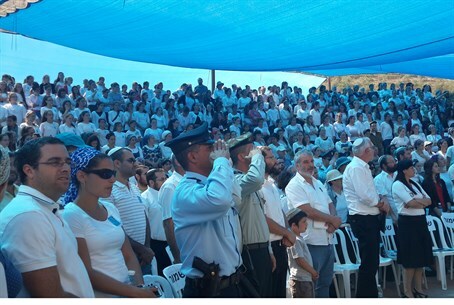 The Binyamin Regional held a Memorial Day ceremony Monday, honoring fallen IDF soldiers and the many victims of terror attacks in Judea and Samaria. The ceremony, which was held by at the central plaza near Wadi Haramiya, was attended by Council Chairman Avi Roeh, Housing Minister Uri Ariel (Jewish Home/Bayit Yehudi), Binyamin Brigade Commander Colonel Yosef Pinto, bereaved families, and friends and relatives of the fallen. Roeh read the long list of names marking those killed in Judea and Samaria - 91 people in all. Victims included IDF soldiers who fell in battle, mothers and fathers who were killed on Judea-Samaria roads, and children murdered in terror attacks. Several students from the Tair Ulpana (religious girls' high school) conducted the ceremony. With each name read aloud, a child ascended the stage and placed a flag in his or her memory. Ariel spoke at the ceremony, emphasizing the need to continue defending Judea and Samaria as a vital part of the Jewish homeland. "Over the years we have lost many dear friends here," Ariel began. He declared that continuing to live in the region honors their memories. "Zionism is always, for now and forever, the appropriate response to any attempts to destroy us." "Thus, [we live] in Kiryat Shmona, Ma'aleh Hahamisha, Shvut Rahel, Yad Rzaiel, Rehelim, and many more places. It is our right and our duty to settle all the land of Israel." Roeh also spoke at the ceremony. "Settling and defending the country requires devotion and genuine dedication," Roeh said. "We continue to believe in [the value of] living life here in Israel. It is through the strength of bereaved families that we continue to draw strength and continue our hold on our land in this country." The leaders' announcement follows the enactment of an unprecedented building freeze in Judea and Samaria.